From the Coliseum Building last night came fierce whoops and yelps, followed by the rattle of rifles and revolvers. For it was not the partisans of either Grover Cleveland, William Russell, or Gov. Altgeld who made the sanguinary demonstrations. The convention does not come for a month. It may be divided up between three, four, or a dozen candidates, but the convention which opened the big building out Stony Island way yesterday was solid for one man. He was the biggest thing in the Thirty-fourth Ward, not expecting the Coliseum Building itself and the statue of the Republic down in the lagoon. Russell may doubt the loyalty of some of his followers, and Altgeld may be in doubt for a considerable portion of the time as to just where “he is at.” But when Mr. Buffalo Cody, at the head of a couple of dozen reformed cow-punchers dashed out from two or three hand[painted mountains and shot 300 blank cartridges into the backs of the redskins chasing the Deadwood stage coach the excited audience simply stood up and holloed. And when the cruel war was over, and the cowboys were borrowing tobacco from the slain Indians in the back room, and the hero of the World’s Fair and all Europe halted his panting charge down in front of the first row of boxes, there was a sense of enthusiasm for which future candiadtes in the Coliseum would be willing to pay. On His Old Stamping Ground. Buffalo Bill was back on his old stamping ground. Last night his Arabs and Indians were again fraternizing with the small boys of Woodlawn, and the cowboys were hunting up some of the old trails that led south to the wet corner of Hyde Park. 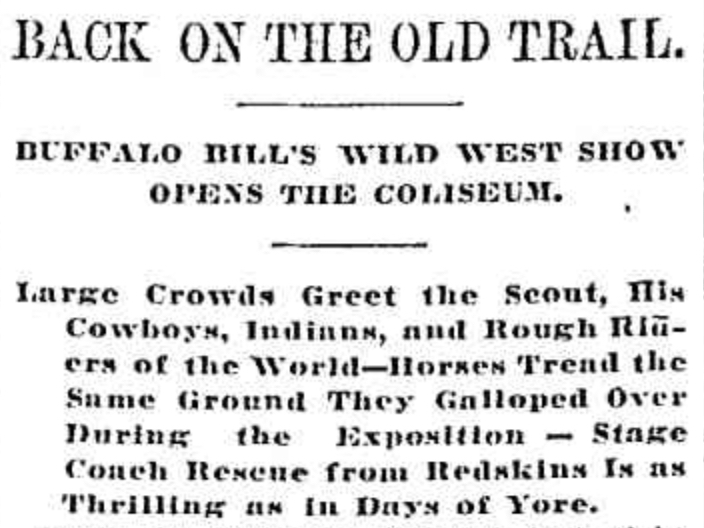 It was appropriate for Buffalo Bill to receive first plaudits in the Coliseum, for the big convention hall stands exactly on the site of his World’s Fair camp. There was a big crowd out to see him, both afternoon and evening, a crowd that came early and staid to the concert. It cheered everything from Buffalo Bill down to buffalo calf that was shot at ninety-five distinct and separate times without apparent injury. It was the same show. The Cossacks charged down on the people in the end boxes with drawn swords, and the Irish lancers rode so stiffly it was feared one or two of them would tumble off and break. There was first of all the grand review, which was a sort of minstrel first part, “introducing all the members of the company.” There were half naked Indians with war paint on, at least the book said it was war paint, and there were cowboys, Arabs, Mexicans, and a detachment of cavalry from a half dozen different countries. And after they had all galloped to their stations the bugles blew a fanfare and Buffalo Bill dashed to the front and waved his hat and apparently said something which nobody understood, but which everybody cheered to the echo. Then there was a horse race, in which a Cossack unfortunately badly defeated a cowboy. A pony post-rider then dashed about the ring, making lightning changes of horses and riding half the time with both feet dragging on the ground. After Buffalo Bill had obligingly driven away a band of marauding Indians and allowed the entertainment to proceed the Arabians took possession of the ring. While the rest of the troops were walking on swords and apparently trying to turn themselves inside out a dancing dervish mounted a barrel and turned around and around for ten minutes straight. He seemed able to keep it up for several months without stopping for meals, and unless an impatient audience shoots him will some day furnish a clew to perpetual motion. Then the Cossacks rode. They ride by hanging to a horse by their hands or their feet or teeth or their hair. It doesn’t seem to bother which. Sometimes they ride in their saddles, but more often they thump along the ground or stand straight up in their saddles or ride backwards, while the audience makes bets on how long it will be before they break their necks. Vincente Oropeza is a Mexican who can do more with a rope than common people can with a wire. He puts a noose in the rope, and then revolves it so that it stands out as iff it were a wire. He jumps into the loop and out again, and ends up by lassoing all of his obliging friends in sight. 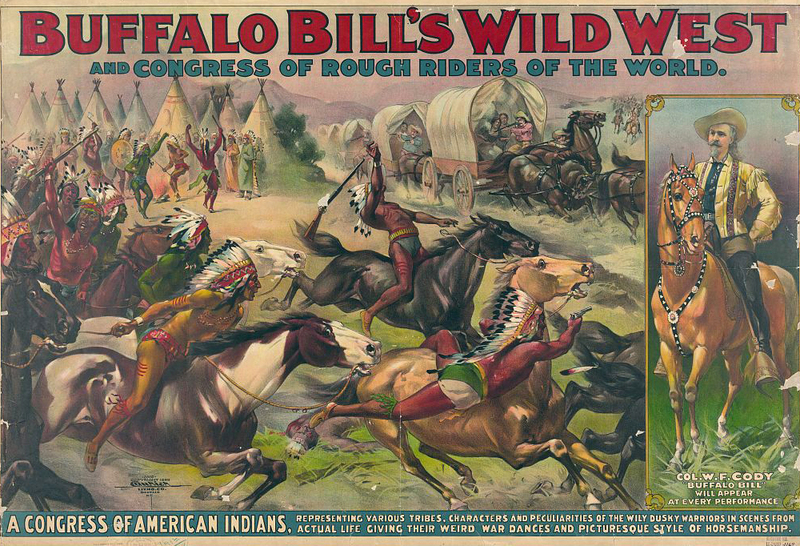 Buffalo Bill, who had already rescued an emigrant train and a stage coach, managed to arrive at the close of the performance just in time to keep the Indians, who had escaped from their dressing rooms again, from shooting the paint all off a property cabin in which the settlers were surreptitiously concealed. When the Indians saw Buffalo Bill they seemed to be struck by the fear that he was going to reduce their salaries, for they immediately retired. The settlers’ lives were saved, and Policeman Higgins of the Woodlawn Station, who contemplated sending in a riot call for the wagon, took his seat again. One thing was demonstrated by the performances in regard to the Coliseum. It is a mascot. 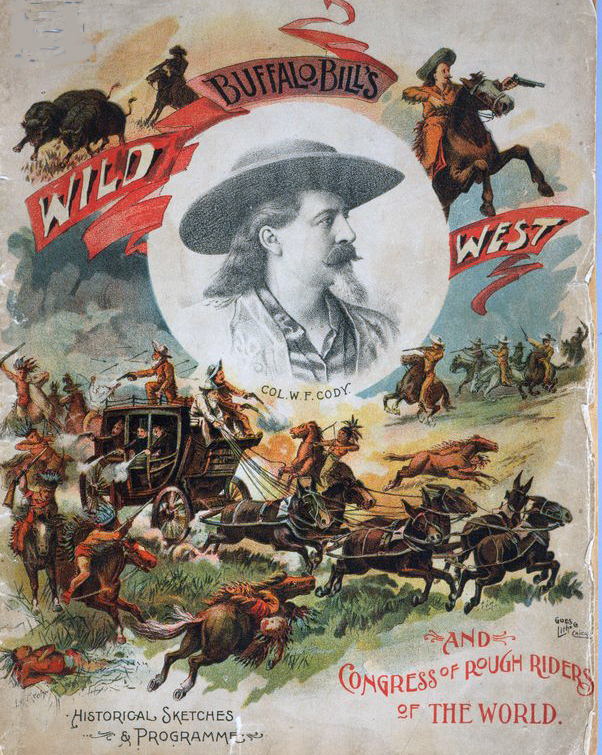 Before the afternoon performance was ended Buffalo Bill received a telegram announcing he could receive the Republican nomination for Governor of Nebraska if he would accept the nomination. “I haven’t got enough money to run for Governor,” he said. Still, he didn’t know but he might change his mind after breathing the air of the Coliseum for two weeks. 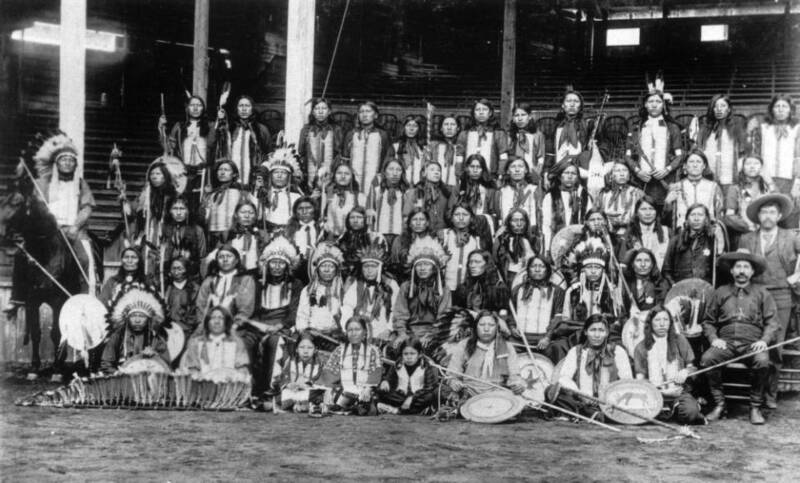 Native American (Sioux) men, women, and children, in Buffalo Bill’s Wild West Show, pose in front of grandstands at the World’s Columbian Exposition in Chicago. Some of the men wear feather headdresses or hold painted shields and staffs decorated with feathers. 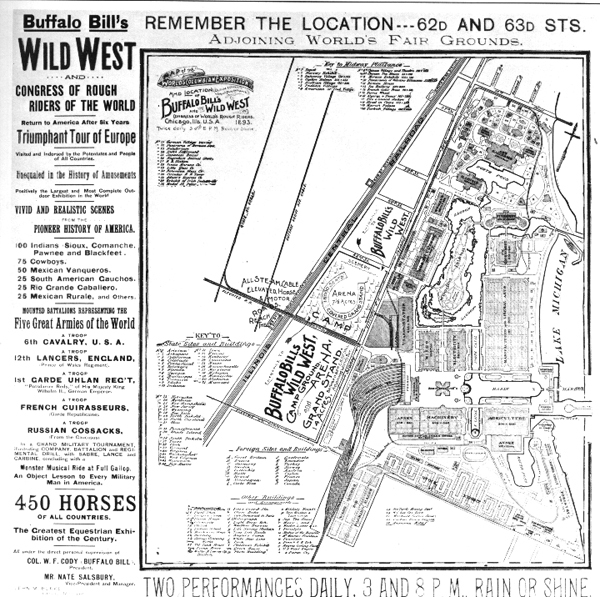 Map of the location of Buffalo Bill’s Wild West Show just outside the Exposition grounds. The Coliseum was located between 62nd and 63rd Streets on Grace Ave.
Woman Punished in Chicago Said Not to Have Been the Famous Rifle Shot. Annie Oakley, the famous rifle shot, who is now Mrs. Frank E. Butler, is trying to remove any confusion of identity which may have been caused by the recent fining of a woman giving the same name at the Harrison street police court. Justice Caverly last evening received a letter from Mr. Butler. dated from their home in Nutley, N. J.. asking him to do anything he could to have the name changed on the records of his court. I hope that you see now that it was not the real Annie Oakley that you fined. If It Is still on the docket as Annie Oakley, can you have it changed? WEST POINTERS AT WILD WEST SHOW. of Military Men, Present and Future. Occupy Boxes. A group of military officers and regular army soldiers, along with the West Point cadets, took in Buffalo Bill’s Wild West yesterday afternoon. Col. Cody had taken his of “congress of rough riders” on a parade at 11 O’clock through the White City. This proved beneficial both to the Fair and the Colonel. It drew an increased attendance of early visitors and several thousand of them followed Uncle Sam’s boys over in the afternoon to help them enjoy the performance. The parade. was an interesting feature with its Indians, Cossacks, cowboys, and cavalrymen. The cowboy band rode at the head on a tally-ho drawn by six horses, Buffalo Bill in a buckskin suit was the central figure of the column. At the matinée Gen. Miles, Gen. Wesley Merritt, and Gen. Stanley occupied the box of honor. All around them Colonels and Captains, Majors and Lieutenants, distinguished from the rest of the audience by their bright uniforms and shoulder-straps. The cadets sat together in a section of reserved seats, wilth Capron’s Battery and the Seventh Regiment veterans on their right. The cadets shouted their academy cry and applauded every act on the program. Col. Cody was given an immense bouquet of flowers.